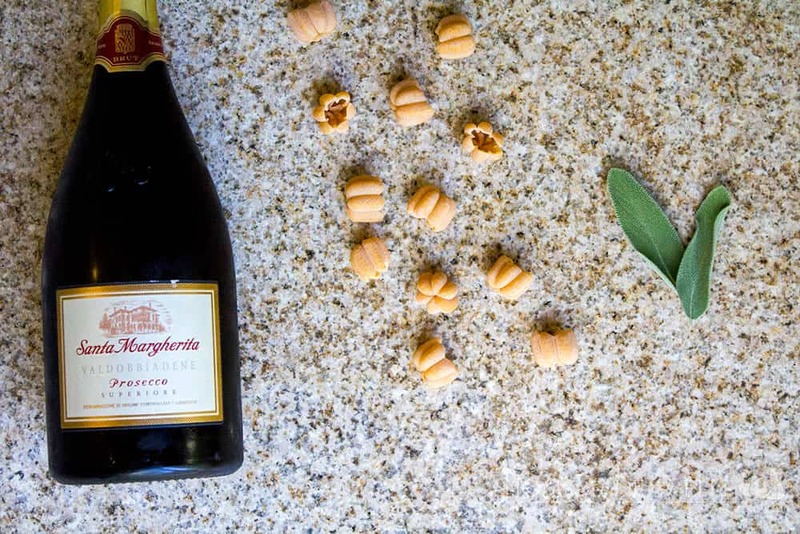 Thank you to Santa Margherita for providing a sample of Prosecco Superiore for this post! I was doing my weekly shopping at Trader Joe’s last weekend, and saw they had Zucchette Pasta made with butternut squash on display. My first thought was that the zucchette pasta looked just like tiny pumpkins! I immediately added the bag to my shopping cart and started thinking of sauces I could pair with this fun, fall-shaped pasta. 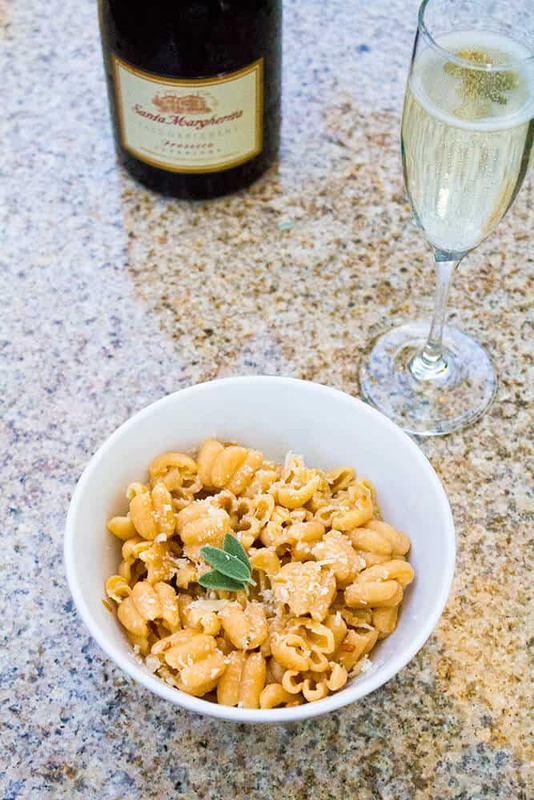 I also had a bottle of Santa Margherita Prosecco Superiore that I had been saving for a special dinner with my boyfriend, so I selected a sage brown butter sauce because it paired well with both the pasta and prosecco. 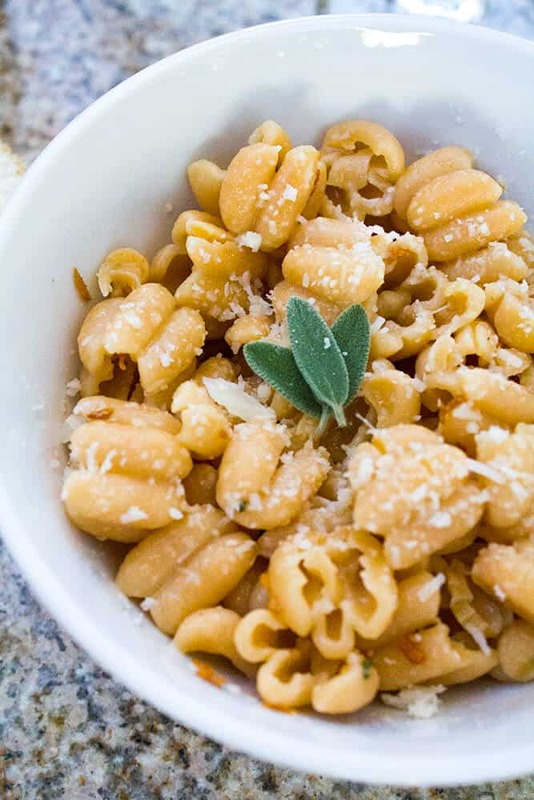 I discovered that the combination of zucchette pasta and sage brown butter sauce is perfect for an easy fall evening! It only takes about 15 minutes to prepare this dish, but it feels indulgent and comforting. 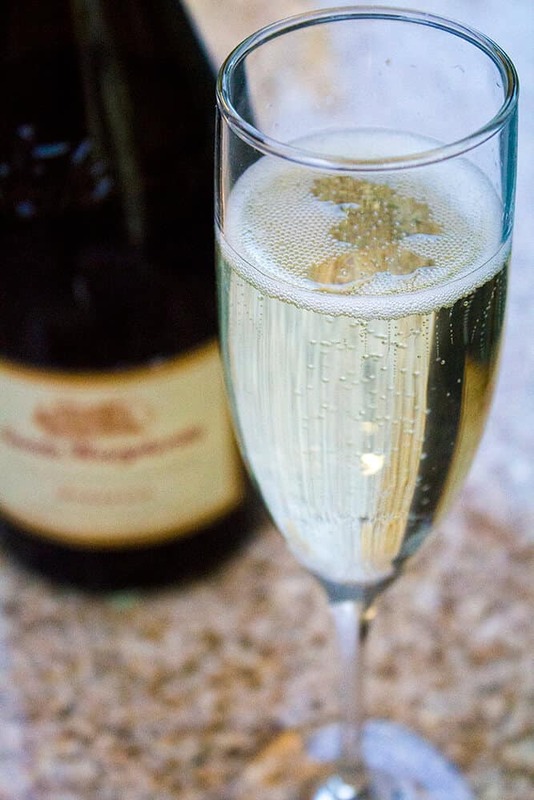 The Santa Margherita Prosecco Superiore has aromas of peaches and sweet flowers with fruity hints of Rennet apples and pineapples. This sparkling wine has DOCG status – which is the highest and most distinctive classification possible. I ended up making this dish and serving the prosecco for dinner last Friday night. It had been a suuuper long week, and I was ready to indulge in a decadent dinner without having to put in a lot of effort. The bottle of bubbly was an amazing compliment. Bring a medium pot of salted water to boil, then add zucchette pasta. Boil according to package directions. Meanwhile, add butter to a small saucepan over medium heat, and melt. Add in minced garlic and cook 1 minute. Add in sage and continue cooking 1 – 2 minutes, until the sauce turns a very light brown (it’ll smell amazing at this point!). Remove from heat and add ground pepper. Toss with pasta and serve warm. Meanwhile, add butter to a small saucepan over medium heat, and melt. Add in minced garlic and cook 1 minute. Add in sage and continue cooking 1 - 2 minutes, until the sauce turns a very light brown (it'll smell amazing at this point!). Thank you for the recipe I also found this pasta at Trader Joe’s. But I wasn’t sure what to do with it at the time.